TOKYO (IDN) - Caroline Kennedy was just 20 years old when she accompanied her uncle, the late Senator Edward Kennedy, to Hiroshima, site of the first U.S. bomb attack that killed 140,000 people on August 6, 1945. In a Senate hearing in September, confirming her appointment as U.S. Ambassador to Japan, she said she was deeply moved by her visit in 1978 that included a tour of the Hiroshima Peace Memorial Museum. In her video message to the people of Japan posted before assuming office on November 12, 2013, she remarked that her trip to Hiroshima had left her "with a profound desire to work for a better, more peaceful world". Less than one month after her arrival in Tokyo as U.S. Ambassador to Japan, Caroline Kennedy – the only living daughter of President John F. Kennedy who was assassinated in Dallas some 50 years ago in November – visited Nagasaki in western Japan, which also suffered American atomic bombing on August 9, 1945. Ambassador Kennedy was invited by the Nagasaki Municipal Government on the occasion of a ceremony for planting a dogwood tree, one of thousands the United States offered to Japan as a symbol of friendship, at the city's Peace Park, which commemorates the 73,000 people – more than a quarter of the city's 263,000 inhabitants at the time – who died in the U.S. atomic bomb attack on the city. Some 75,000 people were injured and hundreds of thousands were sickened by radiation, according to statistics at the Peace Park. Earlier, on November 27, 2013, Ambassador Kennedy told a gathering of the American Chamber of Commerce in Japan (ACCJ) and the America-Japan Society in Tokyo that her father, President Kennedy, had "worked hard to strengthen the U.S.-Japan relationship at a difficult time, and my mother often spoke of his wish to be the first sitting President to visit Japan." She added: "As a child, it made a deep impression on me that my father's PT boat (torpedo-armed fast attack craft deployed by the U.S. during World War II) had been sunk by a Japanese destroyer, yet just 15 years later he was proud to invite the Japanese commander to his inauguration as President and excited about the possibility of uniting the crews of the two vessels on his future state visit. "That's a great parable for our larger relationship and a reminder that when we focus on the things that unite us instead of those that divide us, when we look to the future instead of the past, we truly can create a better world." Atomic bombing survivors (hibakusha) and peace activists have repeatedly pointed out that they would like a U.S. President to visit the two Japanese cities, which suffered atomic bombings. "We do hope that President Obama will respond to our call," said a peace activist. Ambassador Kennedy toured the Nagasaki Atomic Bomb Museum, accompanied by Nagasaki Mayor Tomihisa Taue and other officials, and signed the visitor's book. She also met hibakusha, including former Nagasaki University President Hideo Tsuchiyama and Japanese Red Cross Nagasaki Genbaku Hospital Director Masao Tomonaga. Reports quoted Ambassador Kennedy telling them that she felt the need to pursue efforts toward nuclear disarmament. Ambassador Kennedy's programme also included a visit to the Urakami Cathedral, which was destroyed by the atomic bombing and was reconstructed after World War II. At Peace Park, she offered flowers in front of the Peace Statue, which is dedicated to the souls of A-bomb victims and symbolizes hope for eternal peace. 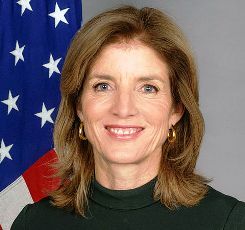 According to the Nagasaki Prefectural Government, Caroline Kennedy is the fifth U.S. ambassador to visit the city of Nagasaki. Her predecessor John Roos attended peace ceremonies on the anniversaries of the bombings in both Hiroshima and Nagasaki, the first U.S. ambassador to do so. Nearly one week ahead of Caroline Kennedy assuming the office of U.S. Ambassador to Japan, the city of Nagasaki hosted the 5th Nagasaki Global Citizens’ Assembly for the Elimination of Nuclear Weapons from November 2 to 4, 2013. Citizens of Nagasaki have continued their tradition of convening such Global Citizens’ Assemblies, which they have held every few years since the year 2000. Participants in the Assembly included representatives from nongovernmental organizations (NGOs) and scientists from Japan and abroad. They heard again the voices of hibakusha, and their urgent appeal that the elimination of nuclear weapons becomes a reality while they are still alive. They also listened to hopeful voices of young people accepting responsibility for achieving and maintaining a world without nuclear weapons. Photo: Caroline Kennedy | Credit: U.S. State Dept.